Last week, three wise men came to our plant in Middlebury Vermont. I had met them at the CES in Las Vegas in January, where both WR3A and their UN Group were featured for efforts bringing technology to the developing world, during the CES Keynote address. I had a follow up with them at the United Nations office of Information and Communication Technologies (ICT) in New York in February. We had lunch with Ambassadors and the president of Korea University, and met UN Deputy Secretary General (from Tanzania). Three of the group (including Paul Jhin, former Deputy Director of US Peace Corps, Dr. YD Kim, former CEO of Hyundai, and Henry Kang, CEO or Earth Therapeutics) came to Middlebury to investigate WR3A's approach to used computers. I showed them how Good Point Recycling domestically recycled 77.5% of all the material we collected in 2008, and the employment generated by whirring tools and balers and sortation of plastics and metals... but I also showed them the 22.5% of material, such as working monitors and Pentium 4 computers, which we carefully triage for hard drive wiping, testing, and eventual export. The UN obviously has to be careful wading into a controversial topic like ewaste and escrap and exports etc. I had shown them the coverage in CBS 60 Minutes, National Geographic, BusinessWeek, etc. in 2008. And I showed them emails from clients asking Good Point Recycling's assurance that nothing will be exported to a poor country. We invited some Vermonters to listen in and participate in the dialogue about the risks and rewards of used computer exports. Corey Berman came from the University of Vermont, one of our most important clients. Norm Staunton of the Association of Vermont Recyclers came and helped take care of the guests when I was pulled away from time to time. Zosha Peters, a Middlebury resident who volunteers for WR3A and who has lived in South Africa, came. And we even invited a new prospective buyer for WR3A, Lucien of Cameroon. Lucien and I had just met by internet, and he offered to come up to Boston to meet with the philanthropists and our clients. Everyone had seen WR3A's Youtube video by now, and more film and photos of our refurbishing partners in Mexico, Egypt, Peru, Indonesia, and Malaysia. 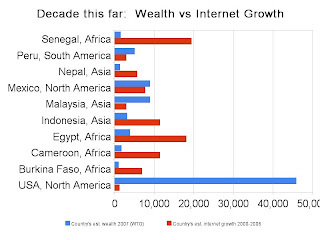 And we looked at the chart showing where the growth is for internet access. WR3A is hoping that the UN can bring some balance and some sanity to the "war on drugs" or rather "war on internet" that is being inadvertently waged in Europe and the USA. The Basel Convention explicity, explicitly, explicitly says that exports of CRTs for repair and refurbishment is LEGAL. Yesterday I got another email from another client insisting that we not export anything. The day before I had a phone call with an OEM representative, who is offering Vermont thousands of dollars for TV recycling... he had been in the maquilas in Mexico where the TVs were assembled, and he thought it was great what we were doing with Retroworks de Mexico and Las Chicas Bravas ... personally that is. But he had to insist that the company's brand of electronics, computers and TVs, be destroyed. He hoped WR3A's message would prevail some day. The UN supporters were really, really attracted to the story of computers being delivered to schools in Africa that were refurbished by smart and talented Africans. They understood that it's possible to sort out working and repairable equipment, and to export without shipping "Toxics Along for the Ride". They are going to visit the factory in Malaysia which WR3A vetted, which is ISO14001, which is legally permitted to import for repair, and which today takes back junk CRTs from across the state of Penang for recycling into new CRT glass. That factory, which Dr. Kim is visiting this month, is moving its refurbishing technology to WR3A partners Egypt and to Mexico. The Malaysians flew to visit the Mexicans. The Mexicans and the Egyptians came to meet with the Americans and the Malaysians at the Recycling Today conference, and came again to the EScrap conference (WR3A sponsored their entrance). Paul Jhin said, "Feed a man a fish, feed him for a day. Teach a man to fish, feed him for a lifetime." This is incredible progress. Recycling overseas is progressing faster than Korea in the 1970s or Japan in the 1960s. And some of my clients want us to sit on the sidelines. As if breaking our equipment is going to keep these people down. As if they are going to stay barefoot and pregnant. Despite the horrible one-sided press accounts, despite deliberate misrepresentation of the facts, we cannot stop this. If I cannot sell them the equipment they need, they will buy it from a back alley. If I cannot move the refurbishing technology, they will fix it with a coathanger.